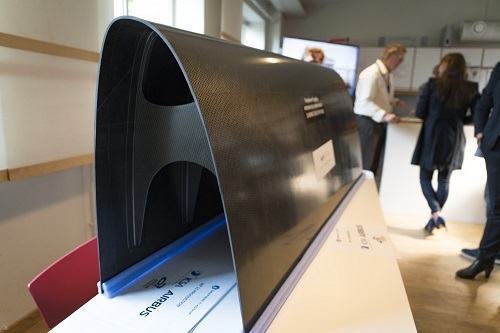 The Graphene Flagship consortium, in partnership with Aernnova, Grupo Antolin-Ingenieria and Airbus, recently used composites enhanced with graphene in the development of a leading edge for an Airbus A350 horizontal tail plane. The leading edge of a wing deals with extreme temperatures due to compressive heating of the air ahead of the wing. Graphene Flagship noted that it is imperative for the leading edge to have good mechanical properties, and graphene increases the mechanical properties of the part, allowing for a thinner build and a decrease in weight. “We worked together with Grupo Antolin-Ingenieria and Airbus as part of the Graphene Flagship’s Production Work Package and our collaboration greatly benefitted from the discussions during the Work Package meetings,” said Ana Reguero, from Aernnova. Reguero also added that Aernnova supplied the resin to Grupo Antolin-Ingenieria. The latter added graphene directly to the resin and applied milling, which creates graphene particles, “an important step to get good graphene infiltration within the resin, avoiding unwanted impurities, such as solvents, which can alter the viscosity of the resin.” Maintaining the viscosity of the resin helps ensure the best outcome during the resin transfer molding of the leading edge. With the addition of graphene, the resin also showed increased mechanical and thermal properties, as well as a decrease in fracture speed. The tail edge will also be thinner, leading to a reduction in weight.